Examples, solutions, videos, worksheets, and activities to help Algebra 1 students learn how to simplify expressions with exponents. 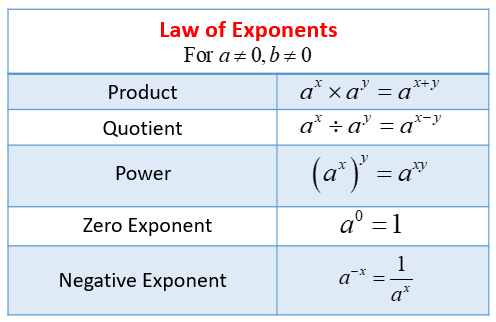 The following diagram shows the law of exponents: product, quotient, power, zero exponent and negative exponent. Scroll down the page for more examples and solutions on how to use the law of exponents to simplify expressions. We can use what we know about exponents rules in order to simplify expressions with exponents. When simplifying expressions with exponents we use the rules for multiplying and dividing exponents, and negative and zero exponents.